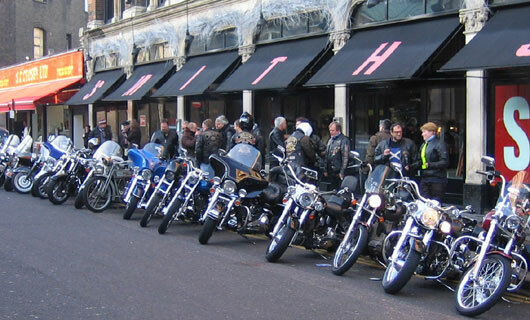 I’d decided that if the weather was dry and the roads salt free I was going to ride my Silent Grey Fellow to the Breakfast meet at Smiths’ of Smithfield. Come Sunday morning and the Gods were smiling on me - I dug out the old fellow from under its heated blanket and with a few positive strokes on the kick starter he burst into life. 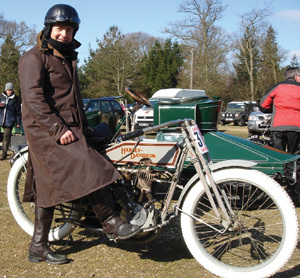 The super rare single cylinder 1914 Harley official title is a 7hp C10 Silent Grey Fellow. The 10 denotes this was Harley’s tenth year of production. Interestingly Harley dropped this model coding the year after and it was also about that time that the practice of getting one of the founders to road test every fresh off the line machine stopped. It is quite likely therefore that Messrs. Harley or Davidson would have sat astride this very machine on its birthday and given it a good shakedown! Riding alongside the embankment it wasn’t long before I came to Blackfriars bridge and then took a right up Snow Hill and into Smithfield market. The early morning clubbers were starting to drift home as I rolled up just as Smiths’ opened up. About 40 C&F and Meridian settled in for some top nosh, exchanging good tidings and wishing well. Another fantastic year of riding over - looking forward to an even bigger calendar for 2008.